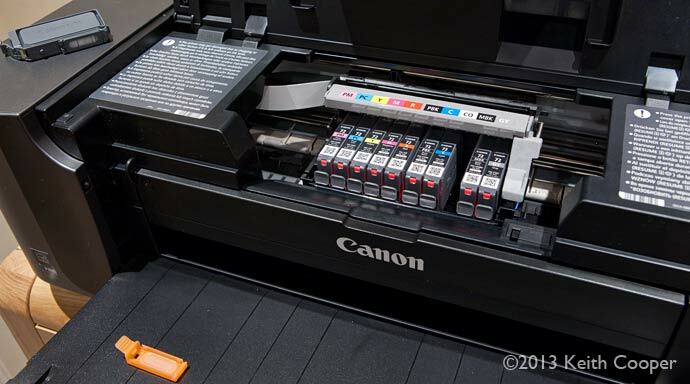 The PRO-10 is Canon’s replacement for the 9500 Mk2 A3+ pigment ink printer, which we looked at a while ago. 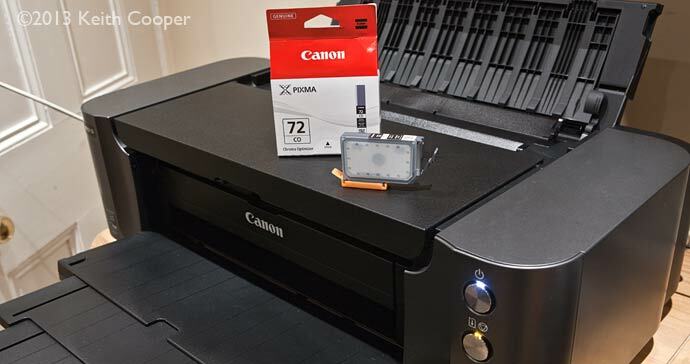 It sits below the PRO-1 pigment ink printer (review) in Canon’s new ‘PRO’ range. 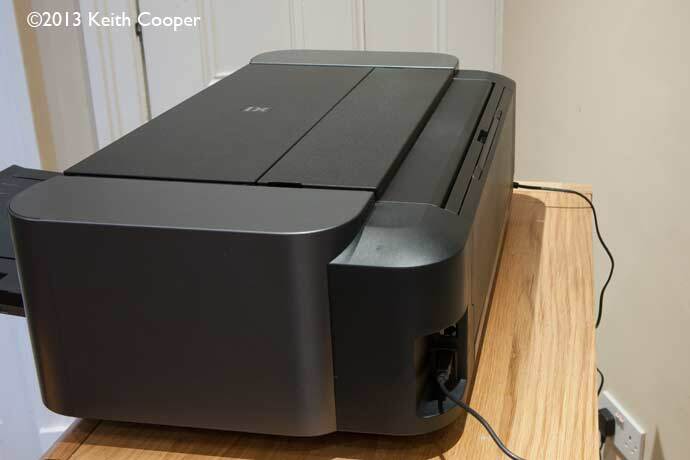 Keith has been testing out the printer with a variety of media and seeing how it performs. Most of this review looks at a Canon PRO-10 driven directly from Photoshop and using an Apple Mac. Functionality is very similar if you were using a Windows PC. 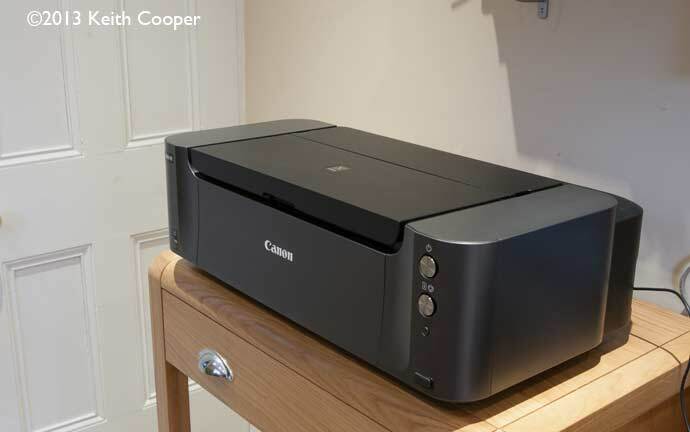 This review concentrates on using the printer for high quality print output, rather than covering the bundled software in any great depth. Modern pigment ink printers are getting very good, and increasingly difficult to tell apart based on print quality alone. I’ve looked at colour and B&W printing with the PRO-10, which is excellent, but also looked at aspects of how easy it is to get these results. Update Feb 2015. 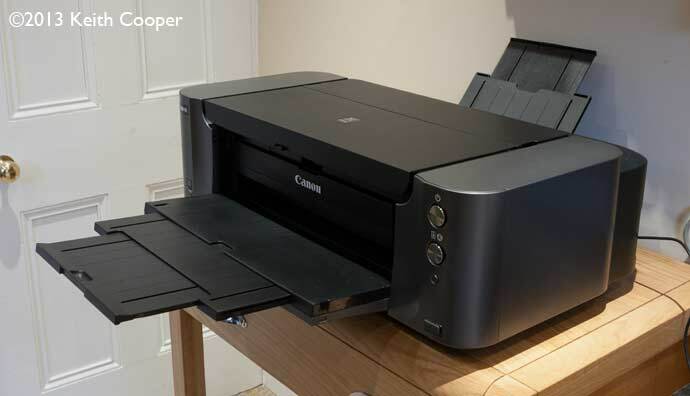 In Australia, Canon announce a PRO-10S model with improved connectivity, but no change to the actual printer. Looking at the specs, I’d say that my conclusions here are still valid. This is quite a long review, but please do feel free to ask if you’ve any questions. 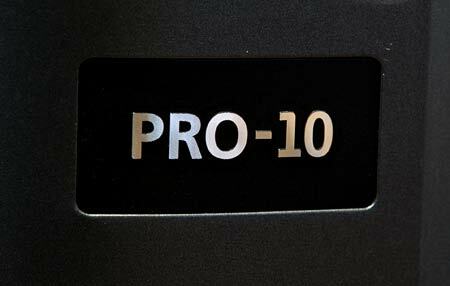 What do you get with the PRO-10? Up to A3+ & 14″ wide prints. 10 single LUCIA pigment inks with high longevity. Exceptional glossy media printing via Chroma Optimiser. 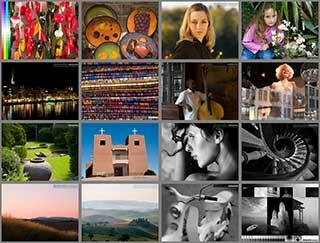 Archival prints on Fine Art media. Wide range of third party media supported. 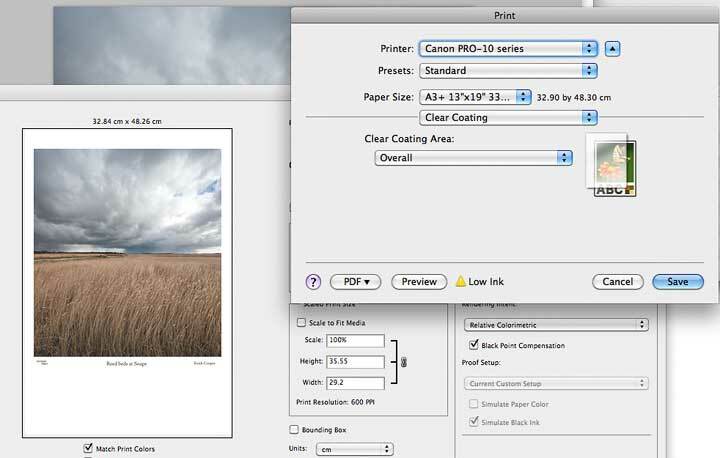 Print Studio Pro plug-in software supplied. 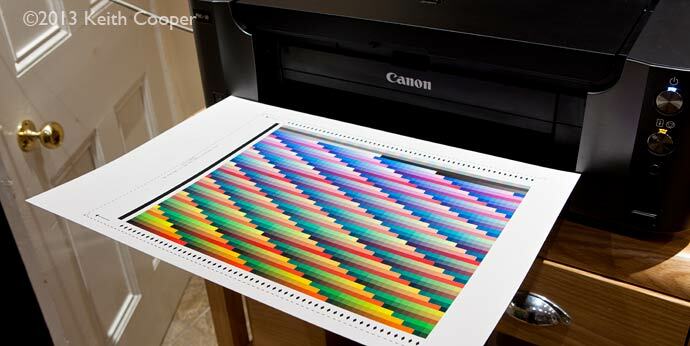 16 bits per channel photo printing. Our review printer was shipped in a heavy duty case (cardboard boxes don’t last long when shipped many times), which meant that we didn’t need to install the print heads to set up the printer. It was in much better condition than the PRO-1 we reviewed and did not need any particular cleaning, although I left it overnight to settle before any testing. You will need a while to carry out the various head alignment prints, but this is a one off operation. The heads are user replaceable, but I’d expect several years of solid use before this was required. I wasn’t entirely sure what was going on during some aspects of the auto installation, with such requirements as waiting for a light on the printer to flash 11 times, but it worked. 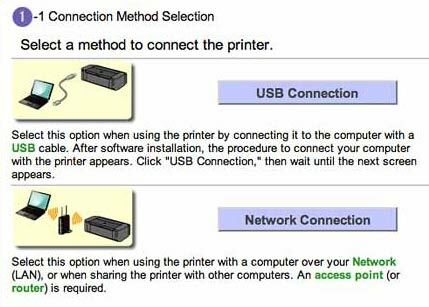 It was quite easy to find the printer on our network from other computers, once everything was initially set up from my laptop. 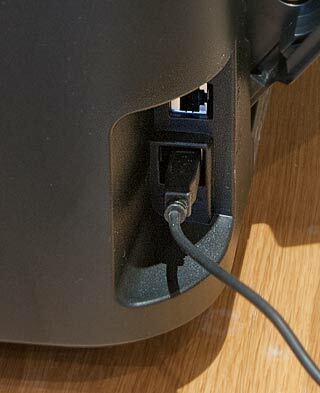 There is a PictBridge socket on the front of the printer – someone somewhere does use this I believe. 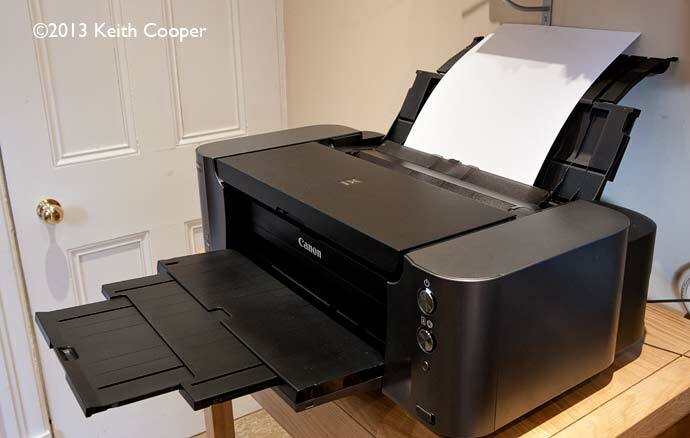 Once you’ve got past the various installation and setup options, the printer is very simple to use. 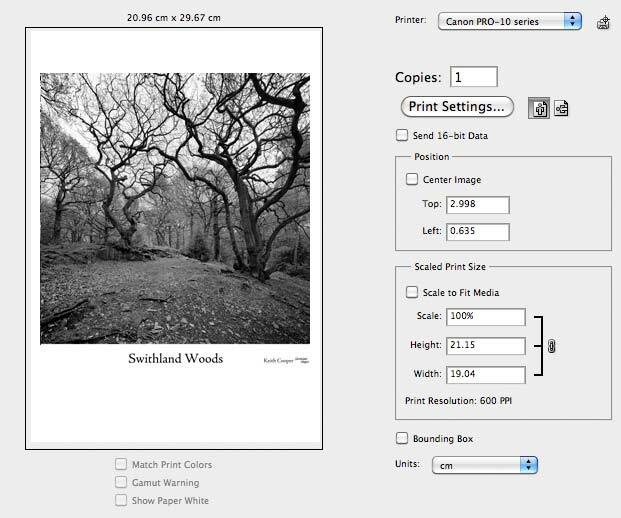 I did all the printing via Photoshop’s print dialog. 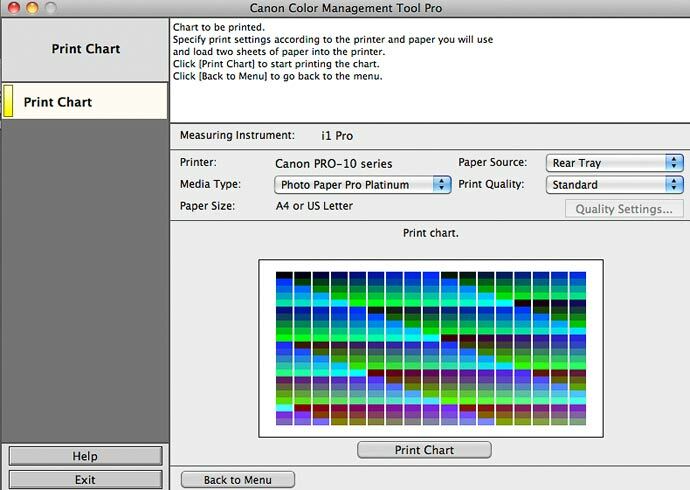 For our large Canon iPF8300, there is an excellent print plugin, but the version for the PRO-10 just seems overly complicated. 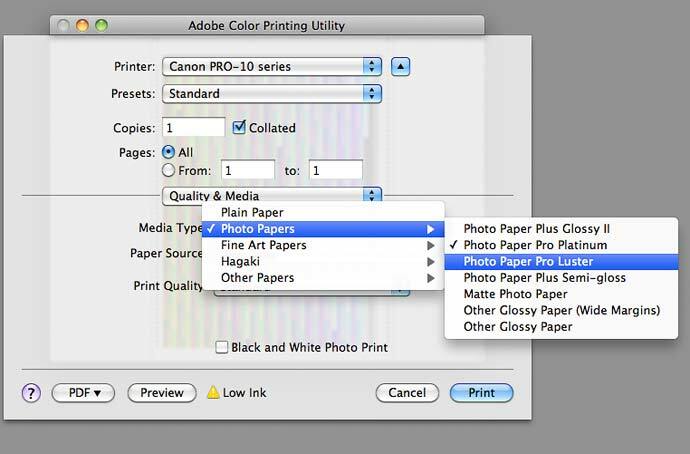 My advice is always to take some time to understand the printer dialog for your main image editing program, whether it be Photoshop or Lightroom, or whatever. Print dialogues can appear complex with all the various options, but generally they have a consistent logic to them – this is obviously going to be a bit different if you use a Windows PC (we don’t have any here) but the principle is just the same – learn how it works. The benefits from taking time to experiment when you first get a new printer are appreciable – far fewer ruined/inferior prints as you go on. 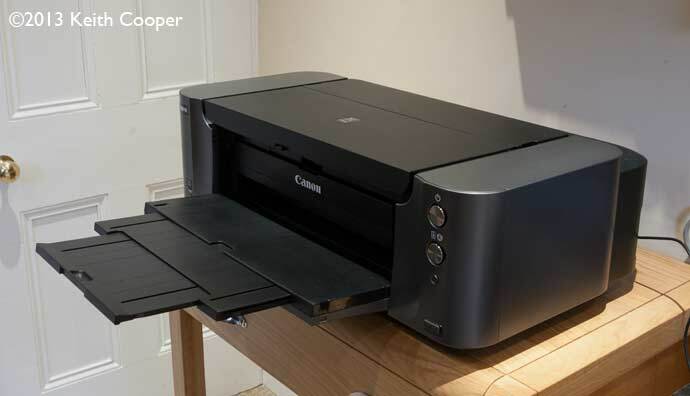 For the best quality from this Canon printer you need to pay attention to getting the media settings right and understanding the different paper size options. 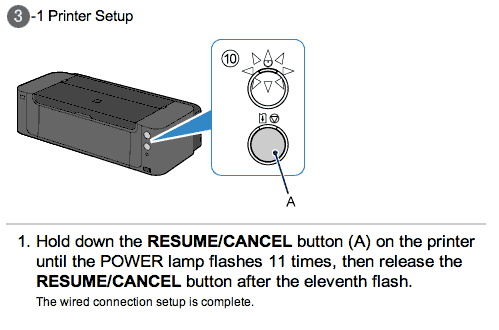 The installed manuals are worth looking through, since what you want is almost certainly in there. I know they are often a pain to read, but it really can help at the start. Print quality at Standard is almost always good enough – I found it very difficult to see the benefits of the ‘high’ quality mode, since I rarely view my prints with a strong magnifying glass. 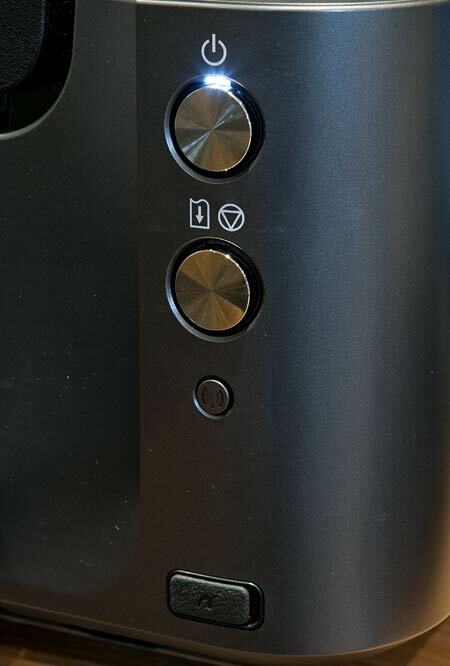 The installed ICC profiles for the PRO-10 are good, but do read the manual for what all those codes mean (the numbers refer to print quality settings). The profiles worked fine, but just like the ones for the Canon PRO-1, you should check options for rendering intent and BPC if available (the soft proof option in the Photoshop print dialog shows the variations well) I’ve addressed this matter in more detail in the PRO-1 review. After only a few prints there was a drastic drop in the levels. 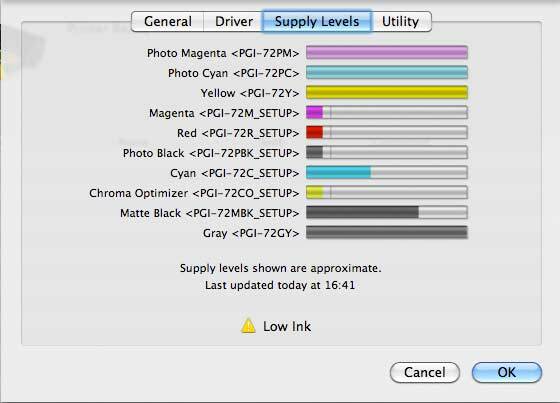 I’ve come across this problem before with Canon printers (including our iPF8300). It’s just that the ink level indicators have a limited number of steps. This can cause big jumps in the level indicators. It means you can be looking at nearly full carts one minute, and only a few prints later, everything drops precipitously. The low ink warnings are also a little enthusiastic (note to developers – numeric codes here are never helpful to real users). There does come a point though, where you really do have to change the ink. The carts contain 14ml of ink and are available in multi-packs (the Chroma Optimiser carts can be found slightly cheaper – they get used up relatively quickly, particularly if you set the usage to cover the whole page) – see ink usage notes in the conclusions for more. The carriage is accessed under the top flap. There are LED indicators for each ink tank – the tanks are simple and quick to replace. The cyan cartridge first flashed as low as I started printing these glossy A4 prints. I finally needed to change the cyan cart after all these prints. Here’s a ’empty’ grey ink cart, opened up to show the ink bag. It still has around 1ml of ink in it. I checked all the empty ink carts during testing and most had a bit of ink remaining, but not much. 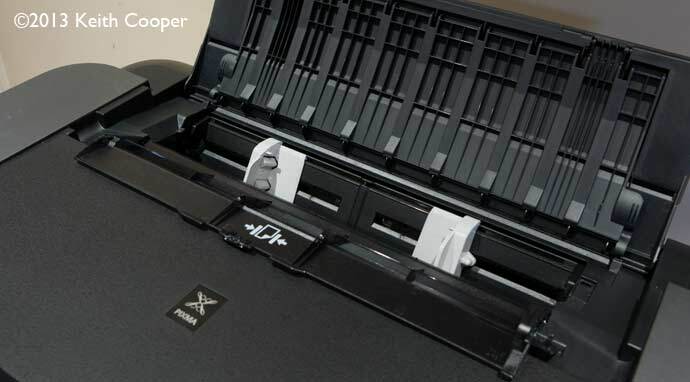 The printer has a range of cleaning functions, including parts of the paper transport mechanism. The PRO-10 seemed much happier after being shipped to us than the PRO-1, so apart from a basic print head clean/test pattern when first starting up the printer, this wasn’t needed throughout our testing. If left switched on, the printer automatically agitates the ink tanks every so often (pigment inks can start to settle if left for a while) – the ink maintenace option is for if you decide to deactivate this (I don’t know why you’d do this, but the manual suggests doing a manual cycle about once a week). 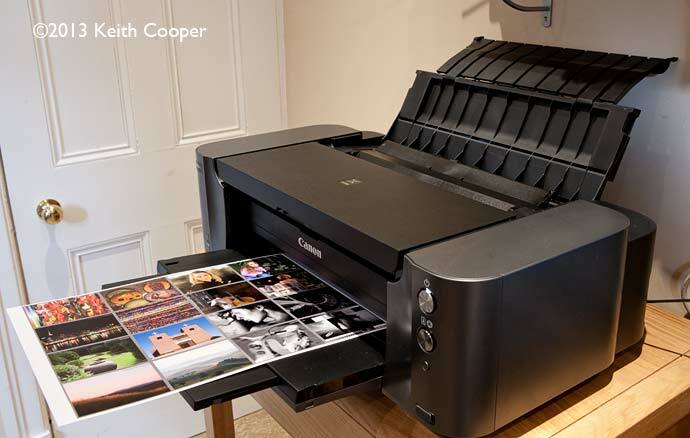 Different types of paper require a different type of black ink – Matt black and Photo black – both are continually installed, so changing paper types is instantaneous and requires no loss of ink in the process. Since some ink is required for head cleaning (automatic or on demand) levels will fall slightly over time, even if you only ever use one sort of paper. The ink set for the PRO-10 includes a clear gloss overcoat – it’s one ‘ink’ that our 12 colour 44″ width iPF8300 doesn’t include. This is a clear overcoating that as this (Canon) graphic shows, is meant to even up surface reflection from the droplets of ink sitting on the surface. This is intended to reduce gloss differential on some shiny surface papers. 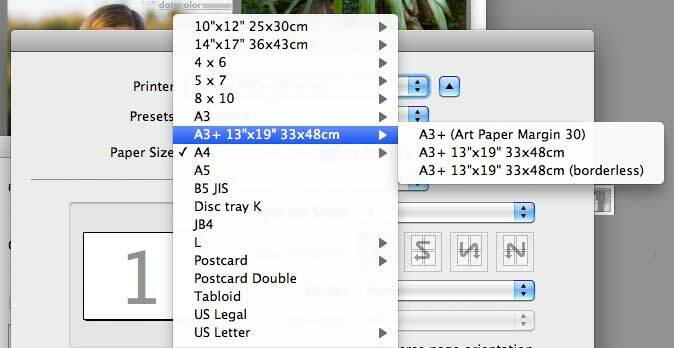 It’s automatically applied as a default, with some paper types. 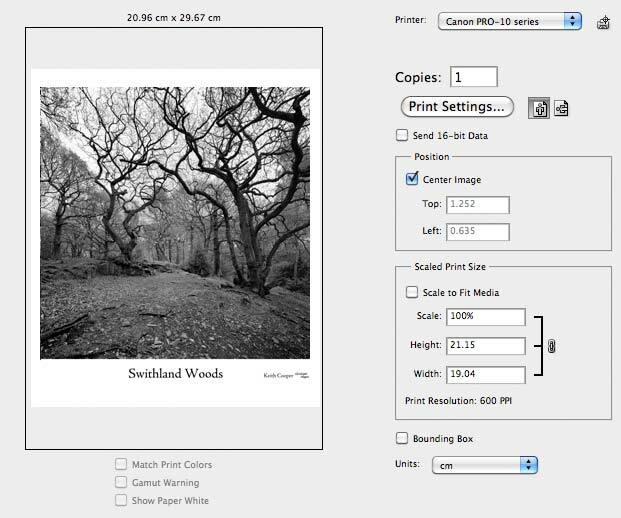 …or you can set an ‘Overall’ mode, which applies the coat to the entire print area. The two prints below show the difference between coating modes. Note how the ‘overall’ coating doesn’t quite go to the edge of the sheet, and that it gives a slight warmth to the image. The reflections I’ve shown here, are from halogen ceiling lamps. It took a fair bit of moving around to get the differences to show up this much – most people wouldn’t spot them. 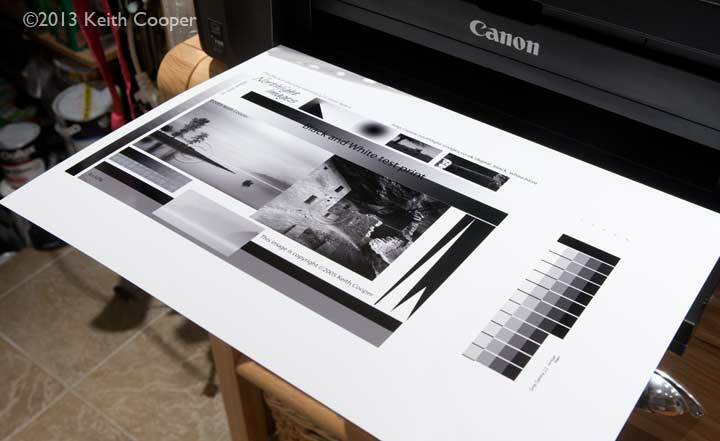 It’s worth experimenting with your own choice of papers, as to whether the gloss coat is needed, particularly if you do your own printer profiling. The ‘overall’ setting also uses up the gloss coat at quite a rate. One minor annoyance is that the automatic option can’t tell the difference between white un-inked paper in the border and in the images content area, meaning that bright parts of an image (cloud highlights for example) won’t receive the optimiser. 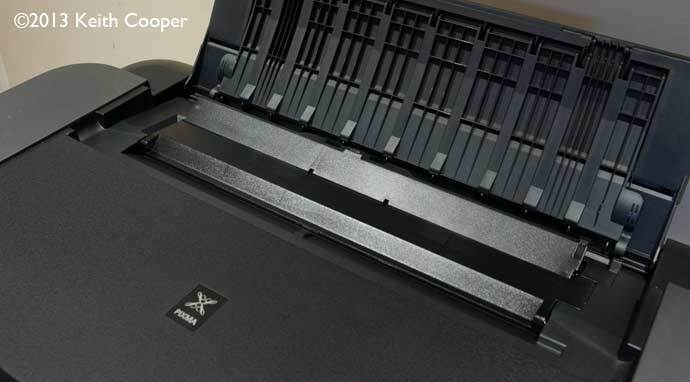 The main paper tray feeds paper centrally through the printer. Depending on paper type, you can easily stack quite a few sheets (A4 glossy in this case). Thicker art papers are individually fed via the back loading slot. Gently push the paper up to the internal stop and hold for a few seconds – the sheet should automatically load. Paper loading at the rear is quite simple, but you do have to take care that stiffer papers go in far enough, for the mechanism to load the paper. This took a couple of tries, but one I’d got the feel for it, there were no further issues. 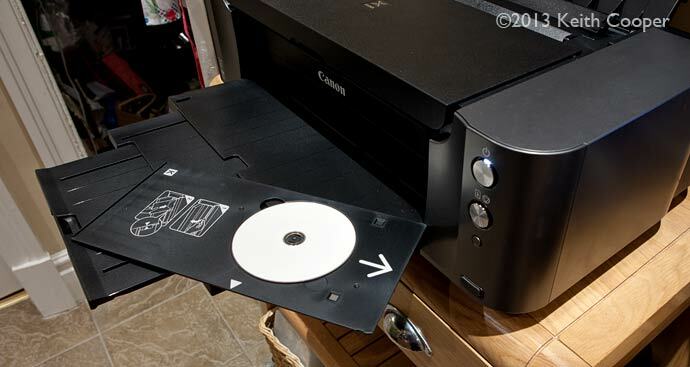 The CD loading tray is fed in at the front of the printer – you lower a flap to insert it. The disk is held firmly in the tray. 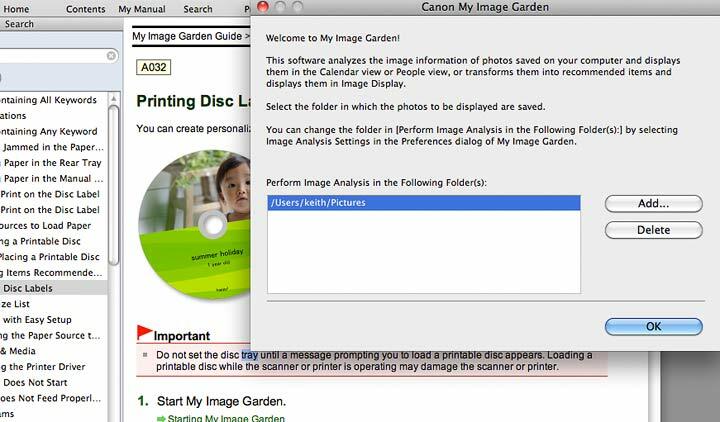 You need to use the supplied software to print, and in this case I’m using the “my Image Garden’ photo software. This allows me to select images for disks. Simple enough to pick some images. A disk of photos from my holiday. Here’s the printed disk a few minutes later. Works just fine and very good print quality too. 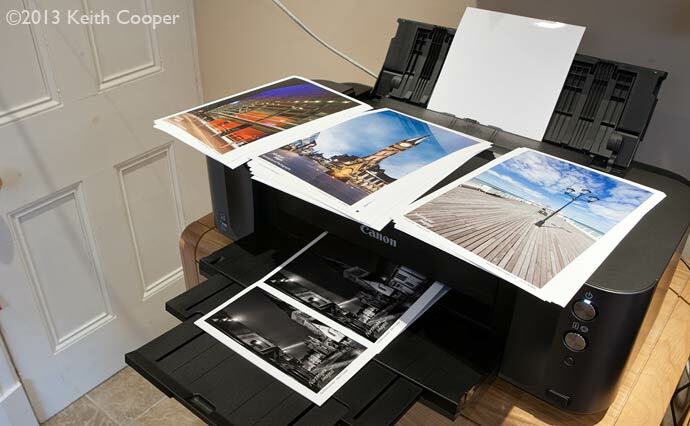 I’ve started off with some Canon paper, Canon supplied ICC profiles and my standard test images. 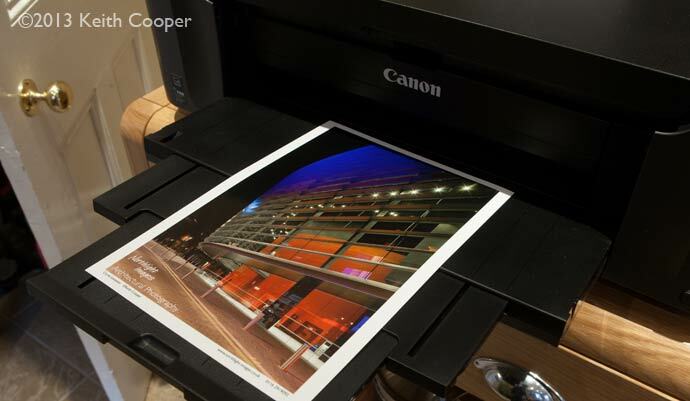 Another image I like to use, is this one of the Curve theatre at night – the reds and blues are a tough test of the printer and profiling accuracy (there is detail in that blue area). For black and white, I’m also trying some cotton rag ‘fine art’ paper. The print is pretty neutral, using the B&W print mode – that’s a photographic grey card behind the print (used to set white balance in this picture). The prints all looked fine, when using the supplied profiles. 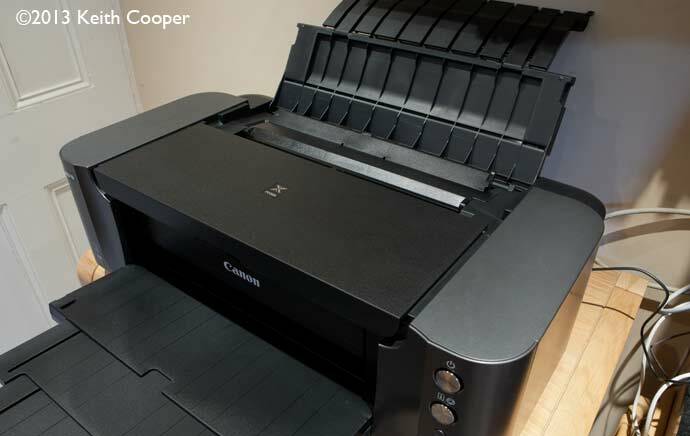 I’ve heard concerns over this printer printing too dark, but could find nothing wrong whatsoever. 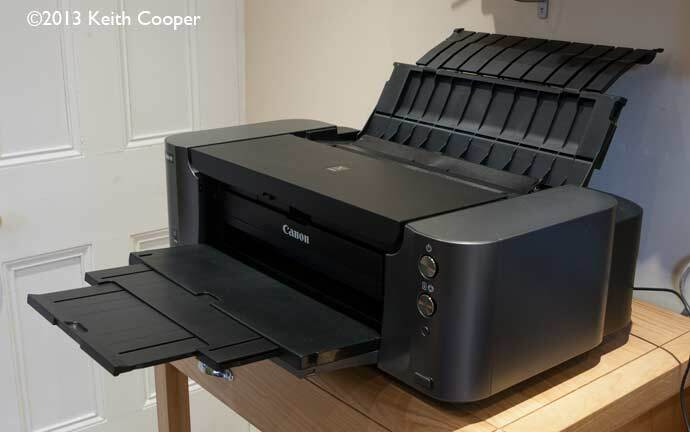 I do note that some of these reports came from when the printer was first announced, and that it took 6 months before Canon UK were able to supply this one for review, so perhaps any glitches were ironed out? 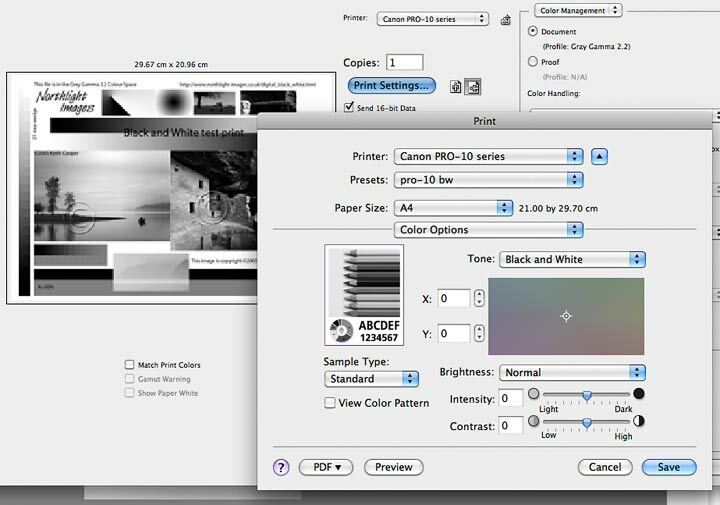 I did notice that as with the PRO-1, the Canon profiles exhibit some unpredictable behaviour if you are using BPC (black point compensation) when printing with RelCol rendering intent – I always made use of the Photoshop print dialog’s proofing options to check images, before printing. It’s important to get the right media setting for the paper you are using, particularly if you are profiling a third party paper. If you’ve no information from the suppliers, then go for one that most seems like what you’re using, although some of the Canon types don’t even match up with some Canon papers I’ve got. The good thing is that modern papers and printer drivers exhibit far less non-linearity than of only a few years ago, and appear far more forgiving of incorrect selections. 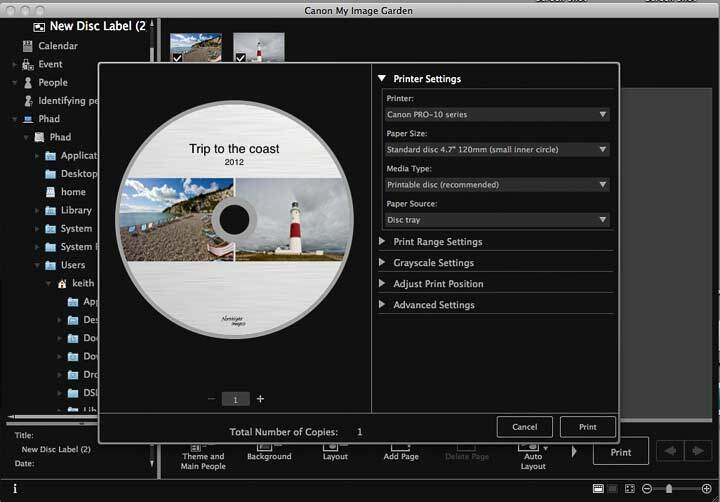 Canon provide a number of generic profiles – the numbers indicate print quality settings, but even reading the profile section in the manual didn’t make it overly clear what the differences were. 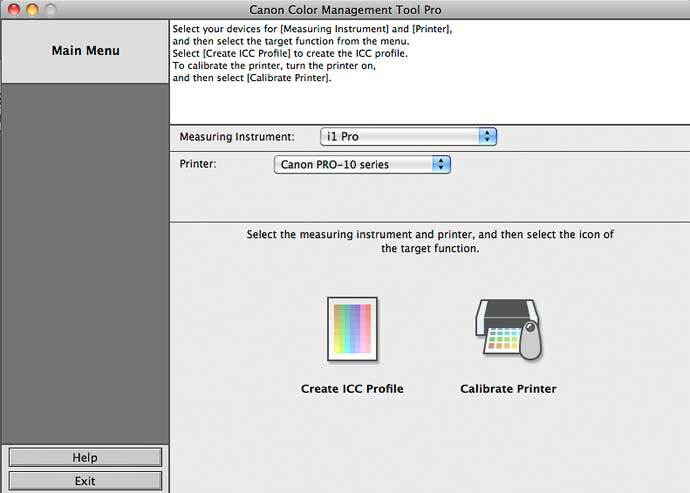 If you’ve an i1Pro or ColorMunki spectrophotometer, you can use the supplied ICC profile creation software. Seriously though, it’s worth running for a new printer, or after changing print heads, as an extra step in assuring the best quality output. The PRO-10 has only one grey ink, so I was keen to see if the B&W print mode was any different from the other two printers. 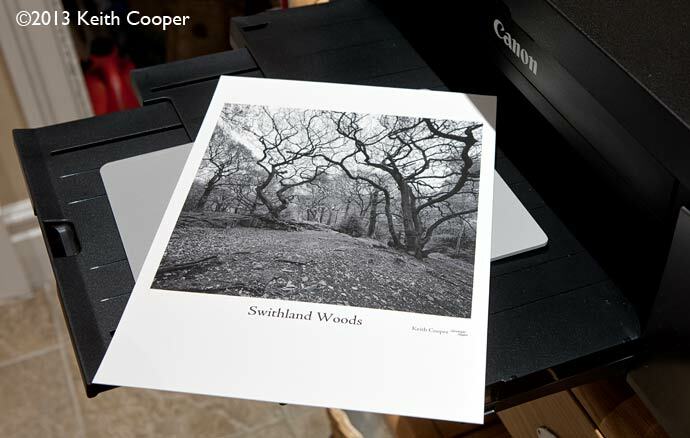 Here’s a test image on Canon Platinum glossy paper, using the B&W print mode, with no adjustments. 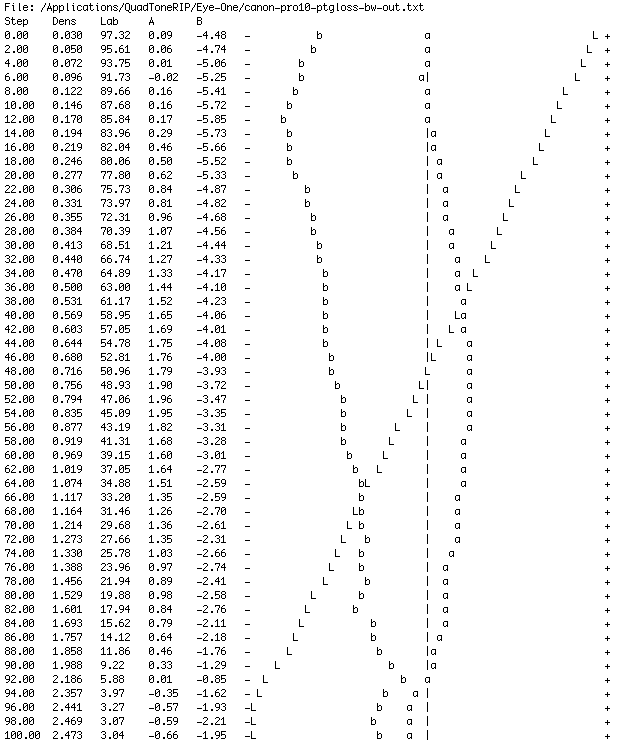 A measurement of the 51 step wedge (using ColorPort software – or with i1Profiler) and running the data through the QTR software, gives this graph. A pretty good linear output, apart from that big crunch of the shadows in the last 5% of blacks. The QTR profile easily fixed this, and made a visible difference to the test image in the shadow areas. 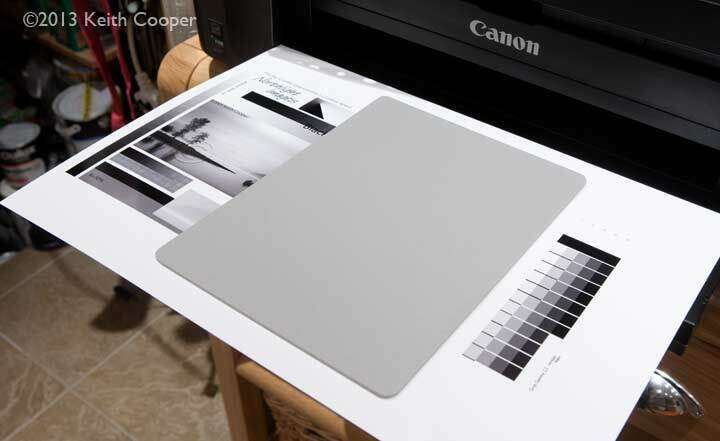 If you take the Lab values for a mid tone and put them into Photoshop, you can fill a patch with the actual colour the spectrophotometer measured – it’s grey, but turn up the vibrance a lot and a slight purple tinge comes through. This is what I’m correcting in the driver adjustments I mentioned earlier. This colour varies with paper type (optical brighteners may affect it), and on matte papers I found the prints more neutral. Whilst on this glossy paper I could see that the B&W test images didn’t look quite as good as on the other two printers (PRO-1 and iPF8300), I was pleasantly surprised by the quality of actual printed monochrome photos. 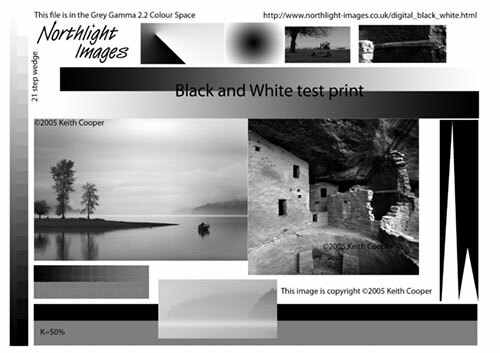 Just remember that the test images are deliberately designed to show issues that won’t appear in most prints. 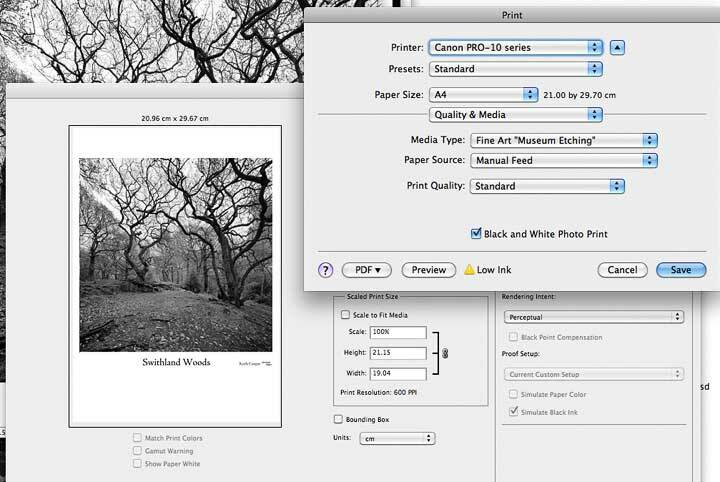 I regularly use Canon’s print plugin in Photoshop to drive our iPF8300. It’s robust, simple, effective and easy to use. Whilst the additional print software for the PRO-10 shows promise, I found it clunky and trying to do just too much. The various software is easy to install, but in general not something I’d have much use for. The printer driver works just fine from my normal image processing software. 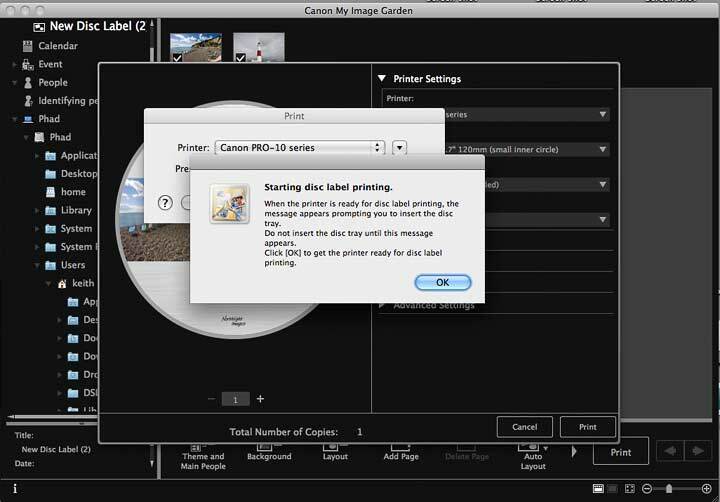 It’s obvious from the amount of software included, that Canon has put quite some effort into making it easy for people to print, with all kinds of options and the like. From my own point of view, learning to print well from Lightroom/Elements/Photoshop will be of much more benefit if you are after top quality results from your photography. We make a specific point of not selling hardware, but if you found the review of help please consider buying the PR-10, or any other items at all, via our link with Amazon. Print quality is excellent from this machine and most people would be hard put to see the differences from prints made with the larger and more expensive PRO-1. 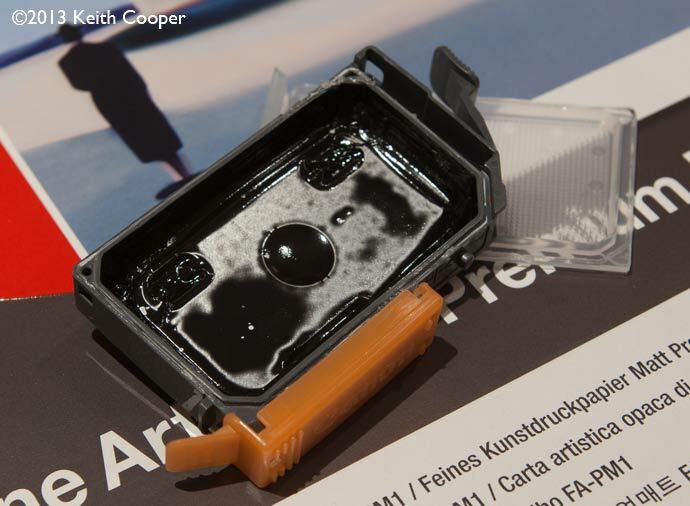 The PRO-10 has less inks and smaller cartridges, so is better suited for lighter use. Paper handling was robust and effective – not a misfeed to be seen, even when I stacked up several packs of glossy A4 paper in the tray. 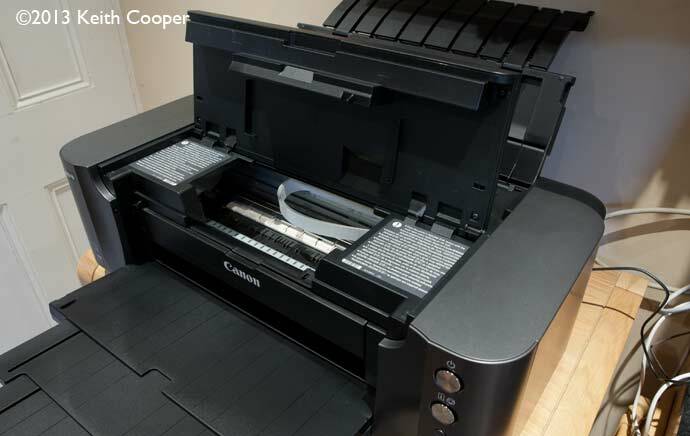 When I looked at the Canon 9500 Mk2 printer, the biggest issue for me was the huge top and bottom margins imposed on some media types. The range of fine art media settings is limited, and two the ‘other’ settings offer no real help as to why you might use them. This is expanded in part of the manual. Indeed, when I first tried a particular B&W print, I’d forgotten this until nothing happened. Eventually I looked back at the computer I was printing from. 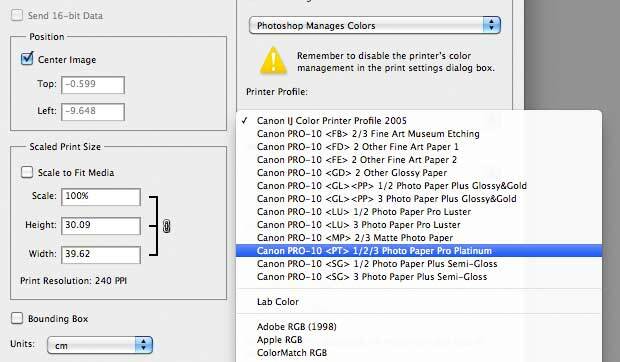 The problem is quite apparent when you look at what the Photoshop print dialog shows. Move your mouse over the image to see the effect after I’d changed to the ‘correct’ media setting. 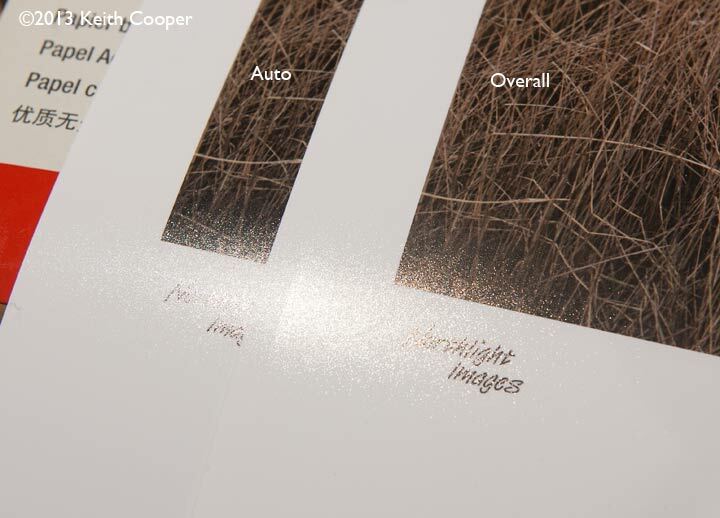 30mm top and bottom margins – pretty poor on A4 or smaller paper. Just as well it was a nearly square image. If you add to this the maximum custom page length of just 26 inches, I see too many features that seem needlessly restrictive. I also asked about this for the 9500 ii and PRO-1, and received the same answer that it was to ensure image quality. Really? – I’d like to be able to decide for myself. 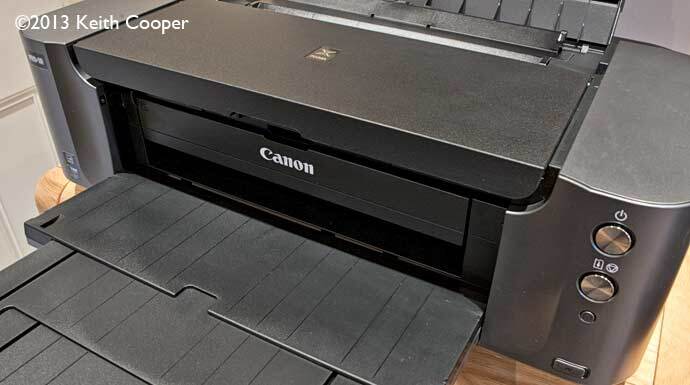 Are you telling me that a company with the design experience of Canon can’t come up with a paper handling mechanism that works reliably for thicker paper? From comments I’ve personally received from elsewhere in the world, the blame for this seems to be laid at the door of Canon in Japan. I’ve run off quite a lot of prints, and once I got over the initial cries of ‘Low ink warning’ and pushed on with the yellow light flashing, the printer seems relatively economical in its ink usage. I must mention that although I printed a fair few pictures, I was starting with a used printer, with partly filled ink carts, and didn’t have nearly enough spare ink carts to test this in a rigorous methodical manner. To their credit, Canon publish ink usage figures, and the methodology they adopt to work them out. 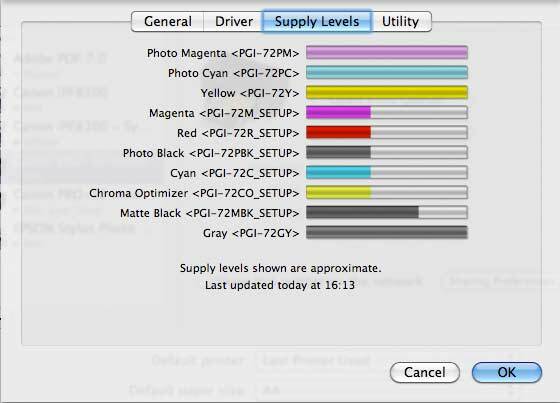 Grey and the Chroma Optimiser were the ones that seemed to go relatively quickly. Indeed, it’s also the grey ink that goes down more rapidly on our iPF8300 (a similar inkset), but it has the advantage of 700ml ink carts rather than 14ml. Looking at the suggested values, and how the inks ran down during testing, I’m minded to believe that these figures are relatively accurate for printing usage. 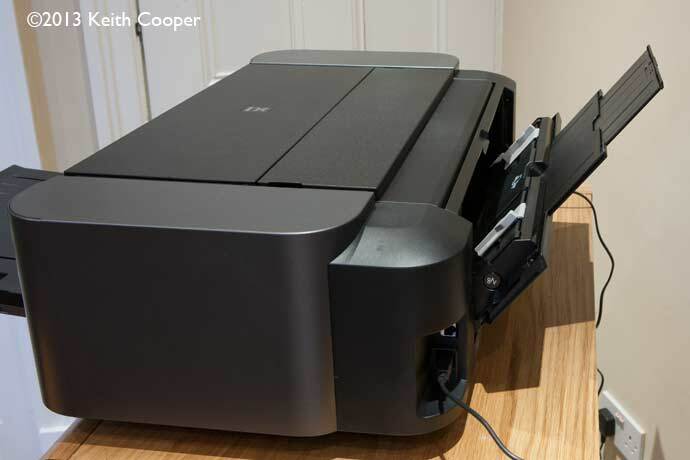 However they don’t include the amounts used in cleaning if you switch the printer off for a while, or the additional slight losses during the replacement of a cartridge. This is countered, if you regularly change media types, by there being no loss in ink when switching from using Matte (MK) or Photo (PK) black inks. That said any estimates are of use, and it’s good to see them. 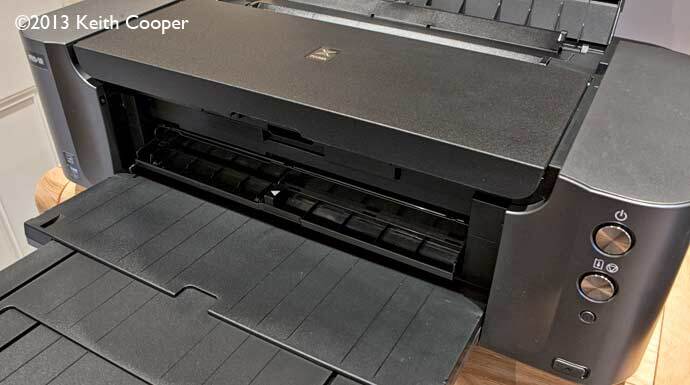 Note that if you get through 3-4 boxes of A3+ paper a month, lowered ink costs would likely save you the cost of the printer in a year or so , if you were to get a bigger printer like the 17″ iPF5100. 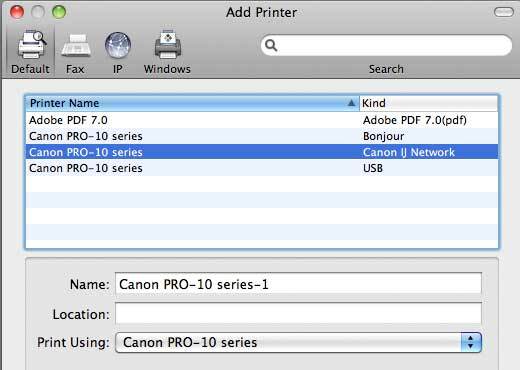 That’s not to say that the PRO-10 is expensive to run, just that bigger printers are cheaper to run, but cost more. The printer produced some very nice prints, both colour and black and white. The supplied Canon ICC profiles gave good results on standard papers, and my own profiling gave very good print performance on a variety of papers. 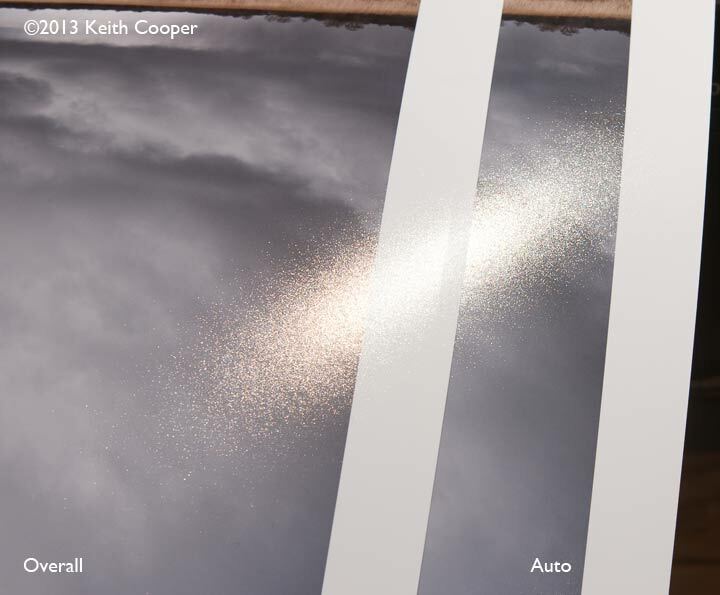 The gloss coat cuts down on gloss differential on some papers and can make a distinct improvement to prints on some paper types. If you’re experimenting with new 3rd party papers, then do try a small test both with and without it. Ink usage seemed reasonable, as long as you use the initial low ink warnings as no more than a reminder to have some spare ink ready. USB, Ethernet and wireless connectivity. 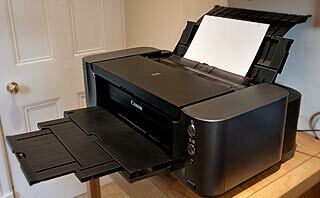 Printer is successor to the Pixma 9500 MkII. Print Engine Inkjet, 10 Single Inks, LUCIA ink system with Chroma Optimiser, 4pl droplet size FINE print head.